Supplementary material reads: "Gershon. City desk. Illus. 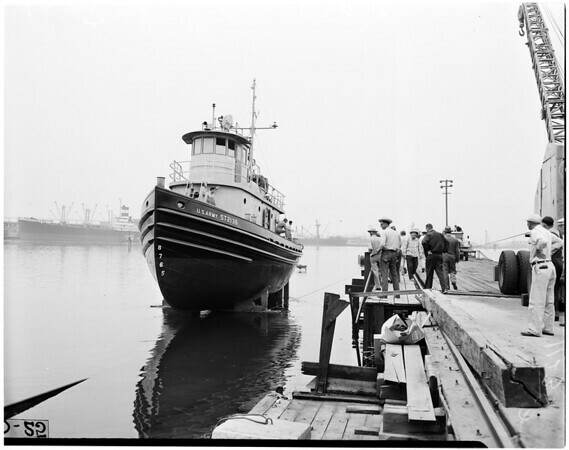 Last Tug Launching. 10 15 -- Last of 26 sixty-five foot all-steel welded tugs in $3,000,000 order poised ready for launching. Launching was unheralded, tug had no sponsor and even traditional Champagne bow-dousing was missing. No 25 -- Tug in water. She is 95-per cent completed. Launching was from Fellows & Stewart San Pedro branch yard which tomorrow will be returned to Government from which it was leased to execute contract".